Description: HuggieBot is a custom robot designed to give people good hugs. I’m interested in hugging robots because of the tremendous health benefits hugs provide. Hugs can alleviate stress and anxiety, lower blood pressure, improve oxytocin levels, provide social support, and im- prove our immune system! This work is based on my previous work with the Willow Garage Per- sonal Robot 2 (PR2) in which I gave it custom hardware and software upgrades to test user preference for robot physical characteristics and hugging behaviors. While an excellent starting point, due to many limitations, neither the PR2 nor any other commercially availa- ble robot was not an ideal platform for a hugging robot. The CAD rendering to the right shows the design, shape, and size of the cus- tom robot built to give great robot hugs. 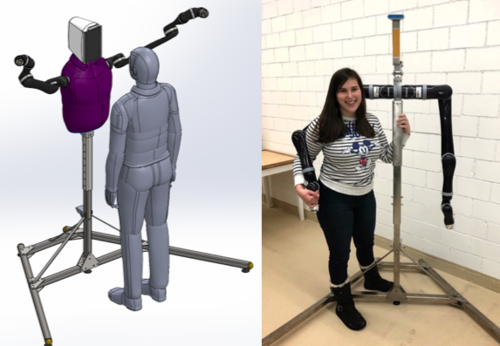 This project will result in an experiment conducted with pairs of par- ticipants over the course of 3 months to test whether sending and receiving customized hugs from a loved one via a hugging robot could help strengthen personal relationships at a distance. Goal: Create a mobile app to customize elements of hugs through HuggieBot. This application should allow for adding a video message to display on the robot’s face screen, setting the hug duration and tightness, and adding a pat or additional squeeze. The recipient should receive a notification they have been sent a hug and should receive a code to scan at the robot to receive their customized hug.